“I’m proud of you.” I hear this from my mother and some other friends from time to time. It doesn’t mean a whole lot to me and I’m not really sure if I grasp the meaning. Of late, I guess my mother is referring to my being a volunteer here in Ecuador. But, lots of people volunteer in retirement! I just happen to be doing it a little farther from home. I’m not sure that I even make that much of a difference. Teaching squirmy pre-schoolers some words in English, some who actually pay a little attention, the rest - who knows? Is that really making a difference? Making swimming lessons available to Brayan...does that make a difference, really? Isabel is learning to drive. Will that really impact her life, especially if she can’t afford a car after we leave? Sharing some ideas with FEDICE, helping with the groups that come from the States, offering home hospitality? Do these things actually make a difference? So why is my mother “proud” of me? I’m just living my life, doing what I can, helping where I think I’m useful. My mom does the same thing, but I don’t tell her I’m proud of her. What is this thing “proud”? Well, I may have actually gotten a little feel for this the other day. I was in one of my classes, getting things ready for the lesson, when one of my students of about 4 years old comes in and says “Good Morning. How are you?” I tell him I’m fine and ask how he is. He says, “I’m fine.” We worked on that in November and December and we’re not working on it much now. We’ve moved on to the names of fruit in English and we have new songs to sing that don’t include this greeting. I swelled up! He actually remembered the greeting in English. In that same afternoon, I was at a meeting with Blanca, a celebration of the inauguration of the brand new “office” for the communities’ women’s group. FEDICE contributed the computer, a printer, a file cabinet, the table, and a chair. The community contributed the space in someone’s home and 10 stacking chairs that can be used for meetings. Someone had brought a cake with strawberries for decoration. The room was filled with the women pre-school teachers and a few others. I asked them what the decorations were called in English. No one remembered. Then, one of my students came in and I asked him what they were called. I did give a little hint: “str........”. And he said “strawberries”! Wow! Go figure. Maybe the work we do on words and short expressions is sticking with a few of the children. And maybe I now know what it feels like and what it means to “be proud”. And well you should be "proud"!!! More power to the two of you !! 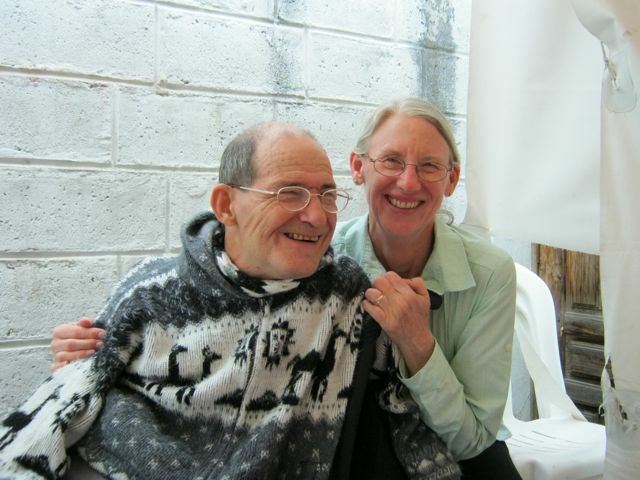 Continued prayers for blessings on your work in Ecuador, and the love you share with the children and their families. Every journey begins with one small step. Today we woke up to no electricity. Today is Superbowl Sunday. If you don’t get the connection, read my first post on CATS! Now! Two years ago I posted about this little-known conspiracy which seems to be based in Ecuador. 60 Minutes has yet to investigate. This is my second clarion call to action. My first post was, admittedly, a little tongue-in-cheek because I had no hard evidence at that time that this conspiracy was real. It is real. The evidence I will present will scare the heebie-jeebies out of you. Not only is CATS (Conspiracy Against The Superbowl) real, but it’s spreading from the lovely climes of Ecuador. Those behind CATS sought to throw others off their trail last year by not having a power outage in Ecuador. Instead, they arranged a power outage at the Superdome in New Orleans during the extravaganza, commentator-dribble, not-understandable-music-at-halftime, hyped-to-the-max, game. Thus, this vigilant soul was not the only one affected. Millions of people around the world suffered! I saw the sinisterness immediately. But I still needed more evidence to induce 60 Minutes to launch one of their investigations that all U.S. citizens have come to rely on. With today’s power outage, marking the fourth year in a row for Superbowl Interruption Potential, there’s no longer any doubt. Where are you 60 Minutes? Remember, Superbowl Interruption Potential (SIP) is harmful to the health of millions worldwide because it induces AOMSC (Anxiety Over Missed Superbowl Commercials) in 99.7% of people wanting to watch the Superbowl. What other kick in the trailing side of the pants (or skirt) do you need, Steve Kroft and Lesley Stahl? The health consequences alone of CATS could run into the trillions of dollars, and not one insurance company, not one, covers AOMSC. True, this year the power outage only seems to affect Otavalo, Ecuador, and maybe only the neighborhood in which we live. The masterminds of this conspiracy can’t pull the wool over my eyes, however! After interrupting the enjoyment of millions of fans last year, they realized they had to slow their sinister plot lest they draw attention to themselves. The real test run was the blackout in New Orleans last year. They’re staying close to home this year only to lie low while they prepare for permanent worldwide SIP. Their ultimate goal is to infiltrate every NFL stadium so they can cause a blackout no matter who hosts the Superbowl. But I’m hip to their ways. And I intend to give them a fiercer battle than they EVER dreamed possible. Granted, there are millions of people who’d rather shop during the Superbowl, or pay eight to fifteen bucks to watch a movie in an honest-to-God theater with Surround Sound, or have their wisdom teeth pulled. I know that. I respect that. But there are also millions of us who want to watch the Superbowl. In peace. We’ve pulled for our favorite teams all year. We’ve employed superstitions, such as wearing every piece of team gear we own on game day, or turning the TV off then back on after every score of our teams, or not going to church on Sundays, or making sure we go to church every Sunday so God will smile on us (and our favorite teams). We’re all too familiar with the heartbreak of flinging a $200 ticket to the field when our team has lost in the final seconds of a game! WE DESERVE TO SEE the Superbowl, for no other reason than to know deep in our hearts that our teams could have beaten the winner (under the right circumstances, of course). WE NEED TO SMASH CATS NOW, while we can still cut off its ever-reaching, deadly tentacles! That’s why I’m calling football (americano) fans, no matter where they may live on our wonderful planet, to join SOS. Yes, SOS - Save Our Superbowl. It’s the only way to prevail against this insidious conspiracy. Dues are only $100/year. In exchange, you will receive valuable advice on how to combat CATS. To prove this is legitimate, I’ll give you the first piece of valuable advice (gleaned from four years of research and frustration) absolutely free of charge. It is: Get yourself a robust internet connection. You will receive the other two pieces of valuable advice upon receipt of your $100. (NOTE: You can choose to pay half dues of $50, for which you will only receive one of the remaining two pieces of valuable advice, which will be chosen at random.) Also, be assured that as CATS tactics change your $100/year will entitle you to the best up-to-date advice on how to fight back. Because I’m on to CATS! 60 Minutes dropped the ball, pardon the pun. On a personal note, I’m just happy that CATS wasn’t put into operation until after February, 2010. At least I got to watch my Saints win the Superbowl in all their glory, with no interruptions besides those necessary to take a swig of beer. I used to say that I couldn’t die until the Saints won the Superbowl. But now I’m called to a higher mission. I won’t rest easy until CATS is dismantled, defeated, KAPUT!!! I humbly thank you for your generous support (checks). FLASH UPDATE: Our power came back on at 9:45 am. I was able to watch a Superbowl so lopsided that the corny flakes in attendance were falling out of it. Still, 60 Minutes should investigate CATS. If nothing else, their ratings would be so high that they could command “Superbowl league” commercials. Hilarious--I loved it, and I don't even watch football--I know that is hard for you to imagine. Glenn you have outdone yourself. This is not only very funny but a very clever fundraiser. Your posts are always interesting. Keep them coming. Best wishes to you both. Your wit knows no bounds! I hope lots of people donate to CATS.